You can delete batches in the Test Manager Test results page. Deleting a batch means deleting all the test results in that batch. It does not impact the baselines related to the test results in any way. To delete a single batch item, hover over the batch until you see the batch item menu and select the Delete option. If you want, filter the list of batches in the batch list as described in How to filter and search batches. 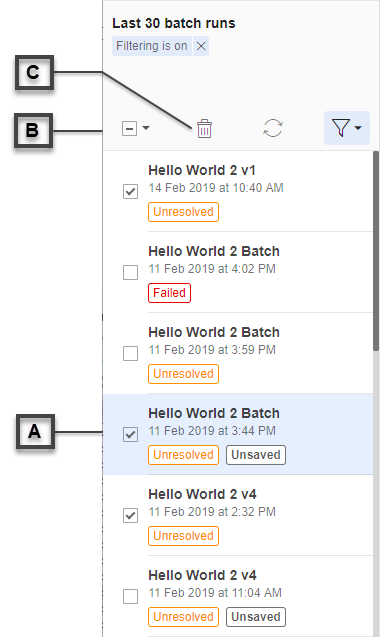 Select the batches you want to delete by clicking the checkboxes [A] to the left of each batch entry in the batch list. You can select or deselect all the visible batches, by clicking the checkbox [B] in the batch management panel. Each time you click the checkbox the current status of the checkboxes will toggle. If you click the triangle to the right of the checkbox, you can choose between selecting "All Batches" or "None". Once you have selected which batches you want to delete, press the Delete selected batches icon, ( [C]). The Test manager will display a confirmation Dialog - choose "Confirm" to continue to delete the selected batches or choose "Cancel" to abort the delete process. Note: When you delete a batch you do not delete the baseline on which that batch was based, the next time you run the test it will use the existing baseline.